Now, as you know, I'm all about trying to get people who drive cars to choose the bike, and that means a lot of people need to pitch in and make the lists of excuses of why they're not choosing the bike shorter. I'm hoping the next mayor of Stamford - either Michael Fedele or David Martin - works with business owners and community leaders to do that. Be sure to remind them each time you see them. Mayors, board of finance members, representatives and others can go a very long way making it easier for motorists to choose the bike, and, after the first Bike Stamford ride last week, I really feel the city is about to turn a corner. But there's choosing the bike…and what bike someone wants to choose. A big thing that might keep someone off a bike and in their car is cargo capacity. We can just hear the excuses now: I have two kids, I have so much stuff with me, I transport Civil War cannons regularly…and so on. If you are among those people, I want you to know: I hear your voice but want you to feast your eyes…on this. This is a cargo bike. It puts the sport back into sport utility. This one is an Xtracycle Radish, and once you get over that odd name you'll see it really is a good looking bike. Xtracyle is also behind the conversion kit to allow a bike you already own to take on your everyday SUV errands (you may recall seeing a picture of artist Lillian Karabaic on one when she was moving a borrowed Brompton). I myself have a particular fondness for the Yuba Mundo, mostly because it looks good in orange and it isn't too heavy for me to lift off the ground. I even test rode one in a bike shop in Vermont and was pleased with the handling. Had it a cushion, I would have happily invited my wife to sit upon the rear deck (be so much nicer to pick her up at the Stamford railway station in that instead of the car or take her to any of the great restaurants in town). Carrying kids about is something a lot of people do with these things. I've seen it firsthand in Portland, Oregon. As I noticed from issue 24 of Bicycle Times - which features a great guide to cargo bikes - a woman there named Emily Finch who transports her six children on a modified WorkCycles Bakfiets, which is a very long and heavy bike with a wooden sleigh-type compartment in the front. Emily even sold her Suburban. Just like we had that fit and attractive woman posing with her three kids with a 'What's Your Excuse?' sign over her, so too should Emily Finch (@1lessgmsuburban). She may have already done this. The internet is a big place. While I like using bike trailers when I can, there's something inherently better about a cargo bike. It just says yes: Yes to picking up toilet paper that come 24 rolls to a pack. Yes to taking a Thanksgiving eve run to the grocery store. Yes to picking up your date. But since I can't afford to buy one myself, I thought I'd honor the superior designers and manufacturers out there by making a sort of tribute to a cargo bike - that might actually work. I was inspired by the new Xtracycle Edgerunner, which features a 26" front wheel and a 20" back wheel to allow for a lower center of gravity for your cargo, and this got me to thinking. Okay: here is the dirt bike I rescued from the Metal Only bin some time ago. It was supposed to tow a small trailer to promote the Person-to-Person clothing driving that was going on at the same time, but the rain put a stop to that. The bike has 20" wheels and a five speed cassette. This, as you know, is the DiamondSchwinn. 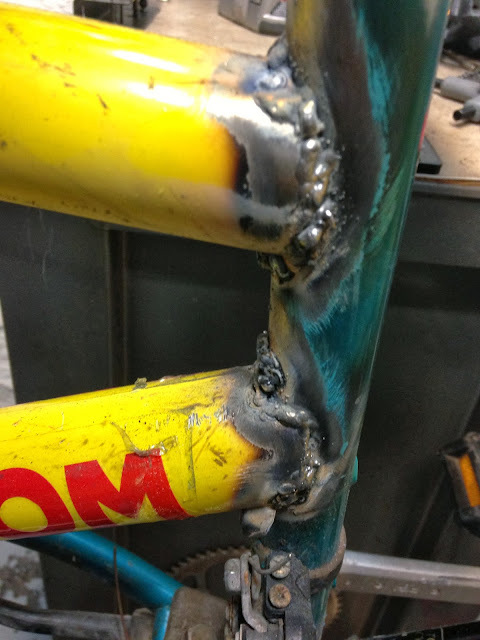 My first successful experiment in practical-but-ugly frame welding, the bike - originally a throwaway from my dad - was immortalized in the legendary Bike to Work Week Coffee Cup Challenge and has taken extraordinary abuse as a Hurricane Sandy Aftermath Bike. I'll leave you to assume what is about to unfold. Now I had no idea what I was doing because I hadn't done it before, so this should absolutely not be seen as way to build your own cargo bike. This is just how I did it, and you can do with that information what you see fit. I got the yellow bike on the work stand and promptly removed the rear brake and derailleur lever before sawing off the headset. Once done, I wheeled it gently toward the back of the DiamondSchwinn, which was about to become the Turducken of cargo bikes. I have no jig or special clamps. What I do have is wire ties, magnets, and a pretty good imagination. I took my own sweet time with that step. I carefully aligned everything by eye before finally flipping down the mask and tack welding the frame. Once I was confident that I had everything lined up properly* I let both frames feel the power from my Lincoln Electric MIG welder. With the slag spilling all about, I worked my way around both tubes. I welded so much, in fact, I ran out of wire and didn't have any left. That meant I'd be unable to finish the build, which I want to be a true cargo bike with the integrated rear platform. But I had proof of concept: I joined two old bike chains together and ran a new, extra long derailleur cable from the handlebars to the back wheel. I did the same for the rear brake by buying a tandem cable (those were the only things I needed to buy for the build; everything else is something that someone threw away). I attached a temporary rack which I had taken long ago from The Mysterious Raleigh Sports, wheeled it out of the welding room and had a look at what I had created. Five thrown out bikes were used to make this (so far), including 3/8ths of my dad's old bike. * It did not snap in half when I sat on it. *I pedaled it from the clothes dryer to the water heater without incident. 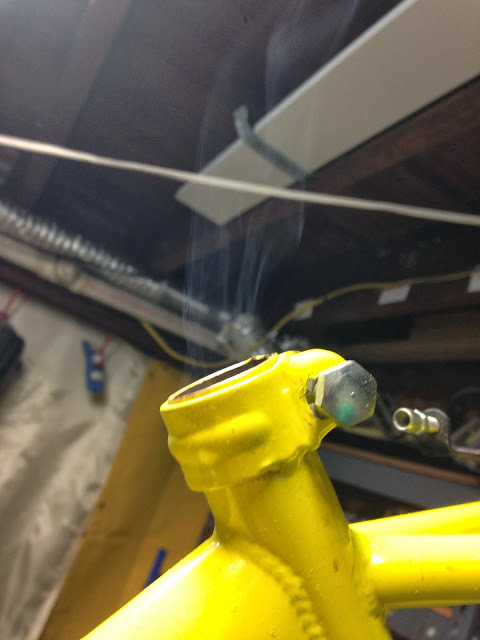 *At the water heater, where I squeezed the brakes, the bike stopped. It almost seemed too easy. I decided that it would be prudent if I had left the bike as it was in the basement until I had finished building it and tested its roadworthiness. But then I changed my mind and rode it to work. And I am excited to tell you that it worked. The long wheelbase does a pretty decent job of ironing out bumps, but it also makes cornering a little more of an intellectual challenge than normal. Of course you see I added everything a good commuter bike needs: lights, a place to put your work clothes, and an under frame rack to put the cable lock. When I ride the Dahon I just take it up to my office, but there was no way the Bikeducken** was going to fit in the elevator, so I parked it in a parking space and chained it to a railing. I reasoned that since I had left my car at home I was still entitled to a space all the same. And later, wearing my work trousers and dress shirt, I rode it home, proudly ringing the loud BBBBRRRRRRINNNGGGGG-style bike bell where appropriate. It's not pretty to look at and the chain makes two different sounds each time it passed through the derailleur (I had spliced together two different brands of chain which probably isn't ideal) but I was still riding something that no one else was…and well on my way to building a complete cargo bike. I still have work to do on it and will keep you posted on the progress I make and the challenges I will put this new bike through. Thanks for reading and thanks for riding. **I swear I just came up with the name 'Bikeducken' as I was typing. It'll stick.